Ryan’s Pizza & Pub is a family owned and operated pizza restaurant located in the heart of Cocoa Village, FL. 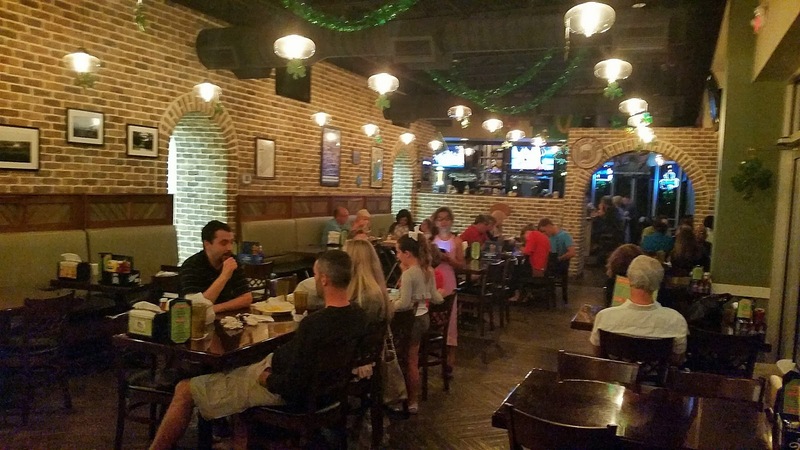 Since its inception in 2006, Ryan’s has grown to be the best and largest Irish pizzeria in Brevard County. While the family restaurant has become famous for pizza, they also make fresh salads, subs and wings and offer a draft selection of fourteen different beers, including Guinness. Ryan's used to be located at 405 Delannoy Avenue in the corner of Cocoa Village that the family pizzeria occupied for almost a decade. While the pies they served up were good, the space was tiny and cramped, so they have moved into a new two story location just up the street at 4 Harrison Street with views of the Indian River and Riverside Park in the newly renovated Parkside Place complex. With Ryan's now in place, the transformation of Parkside Place is complete. What was once an empty space, is now a stylish and colorful block of businesses that includes Village Cycle Shoppe, Bobbi's at Parkside boutique, Village Idiot Pub, Daddy Ultra Runs running store and Grimaldi's Candies. The new Ryan's almost doubles its seating, going from 150 to 287. Downstairs features brick muted greens and reds. Brick archways mark entries to the spacious kitchen and bar area. Picture windows across the front of the restaurant frame views of the park across the street. The design of the custom bar embraces the past with an Old World-feel of the original location. The downstairs bar area includes reclaimed Brevard Hotel doors and wood-look floors to add warmth and texture but easy maintenance," she said. The Brevard Hotel, once a riverside landmark, was torn down in the 1990s. On the second floor there's a covered bar area, plus expansive seating on a shaded deck, all with panoramic views of the river. Garlic Parmesan Waffle Fries are an excellent starter at Ryan’s. These waffle fries are covered in garlic butter, fresh chopped garlic, and Parmesan cheese. At $5.99 they were a good deal and more than enough for three people to share. Pizza has always been the focal point at Ryan’s, and this one was just as good as I remember at the old location. We went big..real big as in a 24” pie. We opted for the Ryan’s Special with pepperoni, sausage, ham, bacon, beef, onions, green pepper, mushroom and black olive on a crispy, fresh crust with house-made sauce. We did leave olives off of one side for one of our guests. Since I’m in Brevard quite often, as I have family there, I am glad to see the further development of Downtown Cocoa and the whole area in general. The section where Ryan’s is at is quite a welcome addition with great eats, drinks and views of the river and the park. If you find yourself on the space coast any time, do yourself a favor and stop in at Ryan’s.